Inaugurated recently, the Guintubdan Visitor's Pavillon and Garden in Brgy. Ara-al, La Carlota City, is one of the tourist destinations of the Province [of Negros Occidental]. Overlooking its top are clean and green botanical garden, ornamental plants, hybrid flowers, waterfalls, spring water, among others. 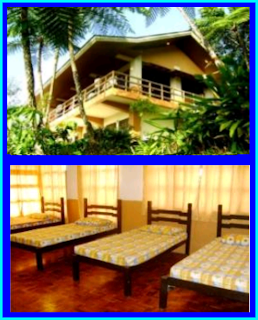 It is furnished with tourist class amenities like rooms, beds, viewing center for meetings and conferences. It is also ideal for overnight stay with a cool, cozy atmosphere enhanced with clean, green landscape environs. Delivering her message at the inauguration of GVP, La Carlota City Mayor Juliet Marie D. Ferrer relayed her personal attachment to the place, "This a place close to my heart, the place where Congressman Jeffrey P. Ferrer told me how he felt about me." Guintubdan is a sitio of Barangay Ara-al, La Carlota City. It is situated at the eastern part of the city. Though, it is smaller compared to other tourist spots in the province of Negros Occidental. It has many natural features to offer like waterfalls, scenic views, and other spell-binding attractions. It is one of the best sanctuaries for those who want to evade the harsh life in the urban cities. Besides, there are also a lot of exciting things to do in this place like a hike to explore the virgin forest, to marvel at the scenic views of the mountains, to wonder what's behind the huge stones, and to delight in the beauty of the flowers. Try visiting Guintubdan and prove that all your worries be taken away! Especially when you stay at the newly inaugurated Pavillon.